Wherever I’m out walking, I always make sure my route cuts through Wychwood Barns. And every time I enter that soaring cavernous Mainspace, I glance up at the second floor opening at the top of the staircase half expecting to see a drummer or maybe a trumpeter up there. If I’m walking in the evening, the twilight blue through the skylight sets the Moonlight Sonata once again reverberating in my head. Even on Saturday mornings with the Farmers’ Market bustling around me, melodies and images are mentally overlaid and seem to hover in that space. For me, the Barns are a palimpsest of Music in the Barns concerts. 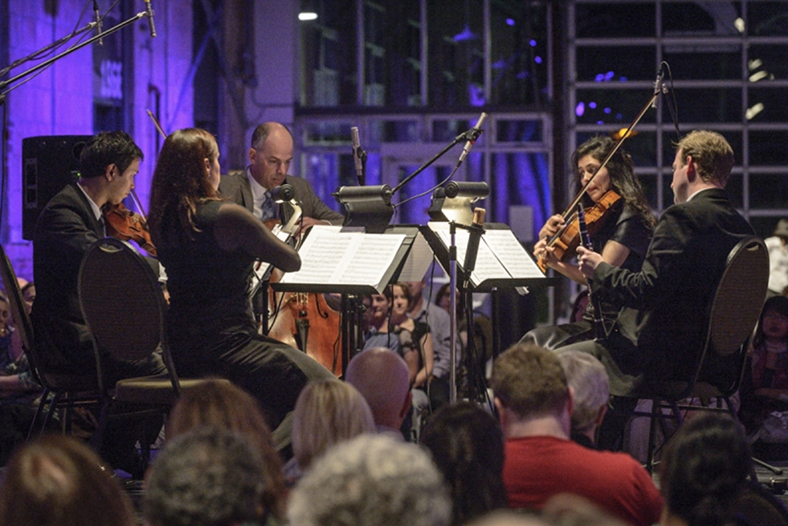 To hear music in Wychwood Barns is a vivid sensual experience that starts with the striking scale of the repurposed streetcar repair facility itself. Its dramatic lofty height is enclosed by solid stone and gleaming new glass end walls. These hard surfaces are softened by acoustic tiles installed above to produce an exquisite sound environment. Concerts incorporate visual art hung or projected on walls and suspended screens. The lighting, as it falls on old stone surfaces, is atmospheric and dramatic. At intervals and for receptions, a wine bar with high cocktail tables creates a convivial feeling of familiarity that incites conversations amongst audience members who until then were strangers. 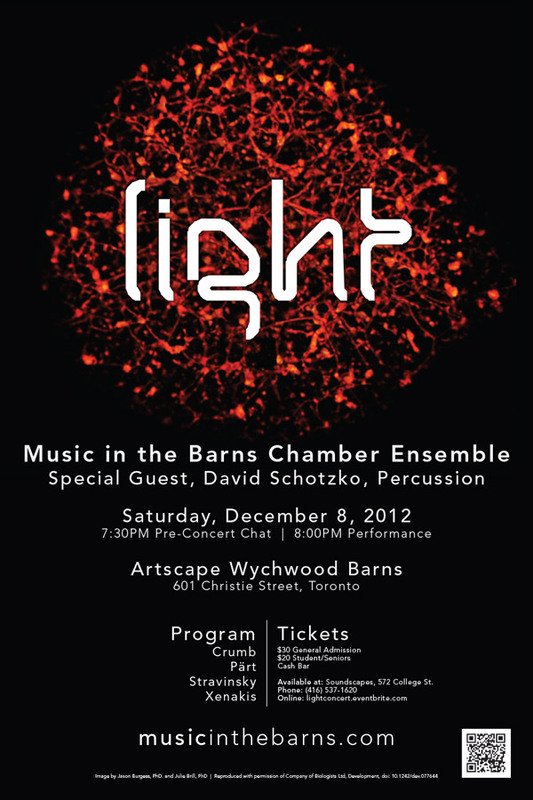 Every aspect of Music in the Barns is innovative – the choice of repertoire, which features contemporary Canadian composers in conjunction with classical masterpieces, the concert venue, the configuration of space, the combination of visual art elements with music, the publicity and funding strategies. Unlike a conventional concert hall, there is no static layout, no permanent stage or seating. Musicians might sit on a small platform in the centre surrounded by rows of seating for the audience. Or the stage may be placed to the side or at one end of the space, with a screen glowing with images on the wall behind. Every concert reconceives the space, and often the ideal arrangement comes in rehearsal. Other configurations emerge as the concert conception solidifies. 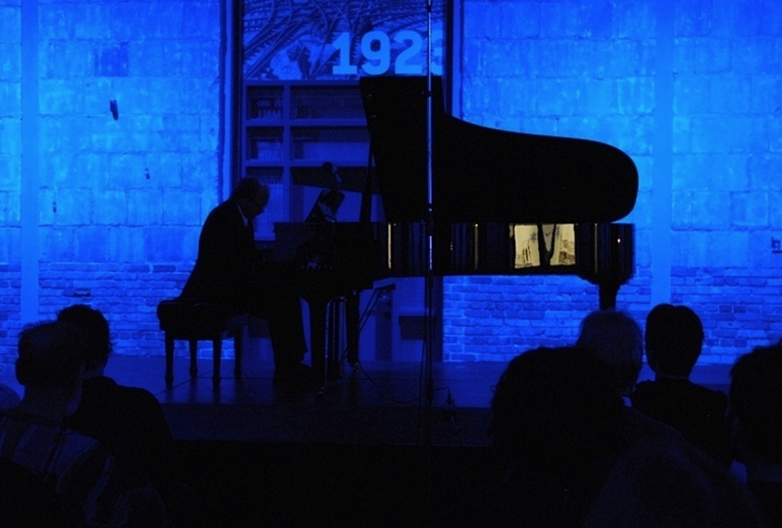 For example, one concert presented a stage management problem because arrays of different instruments would be used for various pieces in the same concert. Rather than off-loading and resetting all the instruments, two separate stage areas were set up. The audience was invited to move between them, standing close to the gleaming percussion for an exciting and intimate listening experience. For Carol Gimbel, logistical challenges become artistic inspiration. 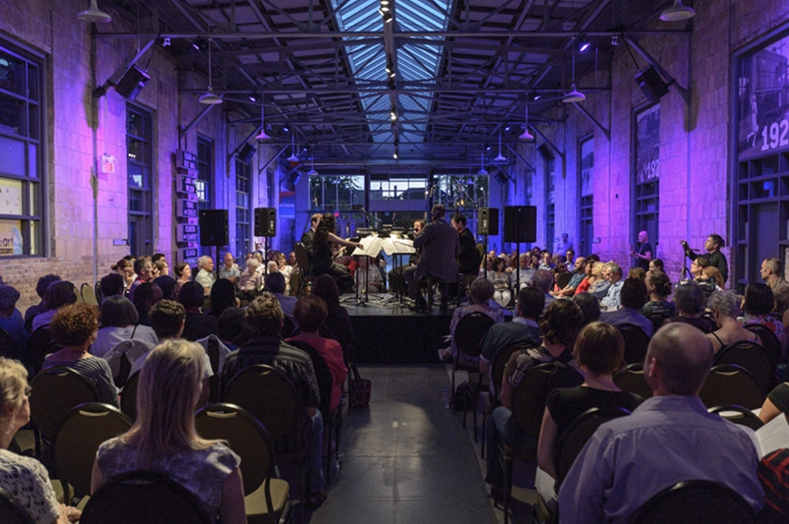 Music in the Barns is moving forward on many fronts. They are working on bringing a show to New York, and performing as part of the Toronto Summer Music Festival. And Music in the Barns will record its first album in the fall. 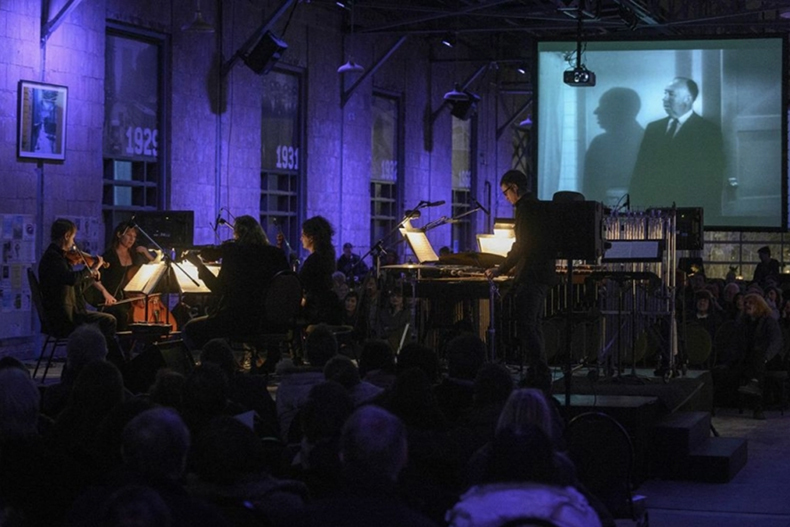 One of their biggest projects ever is Song of Extinction, a large-scale multi-media collaborative project with Toronto composer Rose Bolton, Toronto filmmaker Marc De Guerre and Order of Canada poet Don McKay. This exciting production will be premiered at Music in the Barns in 2016. Gimbel reflects, “I’m really very fortunate – I feel like I’m following a yellow brick road to the concert, and people give me little bits of information and I just try to make sure to dot all of my i’s and cross all of my t’s. And working in this space, you know this is the seventh time, and each time it gets easier. I know more and more what are the potential issues that can come up. Stream music performed by Music in the Barns at Soundcloud. Watch more video of Music in the Barns on their YouTube channel. 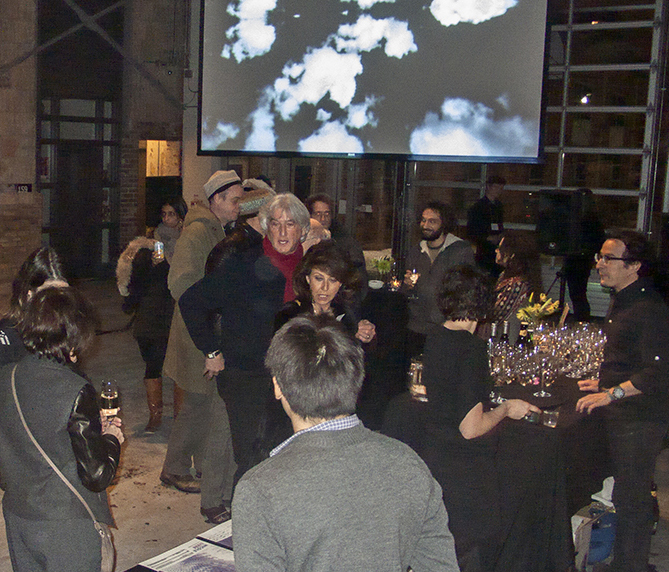 See our previous article on the Barns: POWER TO THE PEOPLE: Saving Wychwood Barns.